I always look at research with an eye toward the axe the researcher is grinding. The fact that a survey is conducted to prove a point doesn’t necessarily negate the value of the findings but it does mean we have to be careful about how questions were asked. That said, I took a look at a study released by the folks at Technorati Media called the Digital Influence Report. It takes a look at the role “influencers” have on purchase decisions and how brands are spending to reach the influencers. I guess the thinking is that if these folks like your product they’ll drive their friends and followers to make a purchase. Technorati‘s axe to grind is that they sell ads on blogs. They’ve put together target segments of bloggers. Not surprisingly, one characteristic of the aforementioned “influencers” is “Influencers are most active on blogs, as 86 percent say they have them and 88 percent of those say they blog for themselves.” However, even with an axe to grind, the point is a good one. For as long as I’ve been in media (since the late 1970’s, thank you) someone is trying to make the point that the audience/spending equation is out of whack. The argument is always “we’ve got X% of the audience and yet we’re only getting Y% of the budget and we should be getting a lot more.” There’s truth in that although it does ignore a few key factors: environment, cost/value ratios, and others. In this case, the food chain look like this: spending against social media is about 10% of the digital spend, and spending against influencers is roughly 6% of social. In other words, it’s tiny, especially compared to the influence these people have against purchase decisions. As you can see on the chart I’ve embedded, 32% of consumers identify a blog as a source most likely to influence a purchase decision. I take all research with a grain of salt. That doesn’t mean I don’t believe it but we should always try to get beyond the intent (or bias!) of the researcher and into the good stuff that might be hidden inside through our own evaluation. What do you think? Every once in a while I get up from my computer screen and take a break. Sometimes it’s to make phone calls. Sometimes it’s just to spend a few minutes watching the news. Anything to step away, clear my head, and refocus. You should try it! Lately, however, I find myself not watching the news networks while they have multiple people engaged in conversations. You know the format – a couple of talking heads representing opposing points of view batting an issue back and forth. Except lately there’s far less dialog and a lot more overlapping screaming. I can’t take it. One person begins to make a point and the other one starts yelling “you’re wrong.” The “moderator” from the network rarely intervenes – I’m sure they’re thinking this is great TV. It’s not. One guest talks over another until it’s time for commercial. It makes my head hurt. It demeans everyone involved. It’s wrong in so many ways and it makes a great business point. I blame the producers. They could be telling the audio guy to cut off a mike. If I was in the booth, the reporter would hear “tell so and so that if they won’t let the other guest speak I’m cutting off their mike until it’s their turn to talk.” You know – kind of how you’d treat a child, which is how they’re behaving. Former elected officials do it. Party officials do it. Rarely, however, do people serving in office do it – they have something to lose – the next election! It would be a disaster if you ran your business this way yet many people do. They talk over customers or are so focused on making their point that they ignore what the other people are saying. One thing digital has done to us all, in my opinion, is curtail our attention spans. We’re used to responding immediately to things and we’ve all become a lot more self-centered. Don’t believe me? Look around the next time you go out to eat – how many people are checking their phones instead of engaging their dining companion? We can’t do that if we’re to be successful businesspeople. We need to cut off our own mikes and listen. We need to moderate the customer feedback portions of our digital efforts. Not to curtail opinion but to enforce grown-up behavior. People want to express their opinions and we should welcome that. We can insist on them doing so respectfully. One of the points in The Cluetrain Manifesto (surely you’ve read it by NOW!) is that in both internetworked markets and among intranetworked employees, people are speaking to each other in a powerful new way. Your business needs someone to keep them “speaking” and not shouting over one another. How are you doing with that? The telephone went out at my brother’s house the other day. This hasn’t been an unusual occurrence and is usually resolved by a call to the folks at Verizon, his telephone provider. One pole in his area seems to have an issue and service will just go out for no apparent reason. When his line failed the other day, I called Verizon to let them know. That’s when things took an interesting turn that is a great example of what businesses can’t do if they want to survive. “It’s because you have copper wire” the customer service rep informed me. “You need to upgrade to fiber optic – have you heard of FiOS?” Yes I have, but that wasn’t solving the issue since repair couldn’t come anyway. Since no one is in the house most of the time, we’d have to call to schedule an appointment when someone was going to be there. Fast forward a couple of days. I was going to be in the house so I called Verizon. Of course, the numbers listed on their website were not correct – I was instructed to call another number (why can’t a PHONE company switch you – strike one). When I got the rep on the phone and said I’d like to get a repair person to the house I was told the rep could “see your house is on old copper wire. We need to upgrade you to fiber optic cable.” I told him I was fully aware of FiOS and just wanted the telephone service I already had to be fixed. Not internet. Not TV. Land line telephone. After a few more minutes of him telling me all about the virtues of a service I didn’t want or need, he gave me the number for repair. I stopped him and asked if he could just switch me over? “”No, we’re a call center (which means he’s probably off shore) and I can’t do that.” In other words, I called the repair number and was sent to a sales center to sell me FiOS. Land lines are an endangered species. It’s a once-ubiquitous business that’s declining rapidly. 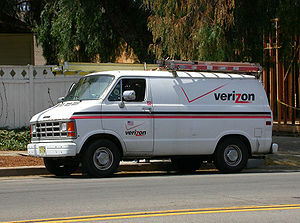 Rather than selling the service on the merits – clearer voice, much better reliability in an emergency such as a storm – and providing excellent customer service to those still paying for the service, Verizon seems interested only in pushing FiOS. This is what no business that wants to be successful can do – ignore the voice of the customer. It’s not about what you’re selling – it’s about what I need when I interact with you. There is no chance you’re selling me additional services when you demonstrate that you won’t service the ones I have. Many businesses still put themselves above the consumer. We can see it in their messaging, paricularly in social media. It’s all about the brand, it’s all about the sale. Sorry, guys. Not anymore. I fixed the telephone line myself – it turns out there was a short in the alarm box that connected to the telephone line. It took about 3 minutes to figure it out and to fix it. We’re in the process of selling the house and I want to be the one to call Verizon to turn off the service. I suspect if this is how they treat all their customers that I’m not alone in wanting to make that call. Do you own an immersion blender? They’re the Foodie Friday Fun topic this week. Maybe you call it a wand blender or a stick blender or maybe you call it the “boat motor” as do a few TV chefs. Whatever you call it, the tool is a sharp blade at the end of a stick that a cook uses to blend food in a pot or bowl. Soups, whipped cream, mayonnaise, and pesto are all things for which I’ve used mine. Restaurants use much larger versions in their kitchens and they’re really useful to have in the home kitchen. There was an article on them called “Bandages Not Included” in the NY Times two months ago. One thing that happens fairly often in the home kitchen is that cooks try to clean food off of them while they’re still plugged in. The blade is very sharp. The on/off switch is under your thumb by design. What could possibly go wrong? While I’ve been fortunate never to have pureed a finger into a stew I was thickening, the article got me thinking about business. A lot of firms use the business equivalent of an immersion blender: social media. Like the stick blender, the tool seems very simple and is easy to use. A business can also cut off a finger pretty easily. In the last year, KitchenAid, McDonalds, StubHub and others have been in the spotlight for doing exactly that. Personal tweets sent from a company account, commercial messages tied to trending topics without understanding why they were trending, and “set and forget” use of automated tools have caused brands massive headaches and public black eyes. Companies perform the social equivalent of cleaning off the blender blade without unplugging it first every day. Simple tools often lull us into a sense of complacency and that’s dangerous whether we’re in the kitchen or on the Internet. That’s why your business’ social media activity needs to be managed just as professionally as the rest of your business and not by an unsupervised intern or someone unfamiliar with each medium’s particular potential pitfalls. These tools are dangerous even though they’re incredibly useful. Like the immersion blender they can be the best way to accomplish a branding task. Provided, of course, you do so and hang on to all your fingers. There’s been a lot written since Facebook did their IPO a while back questioning their business model. If we fail to retain existing users or add new users, or if our users decrease their level of engagement with Facebook, our revenue, financial results, and business may be significantly harmed. Fair enough. After all, without users continuing to add content, what’s there? Which is why a couple of things I’ve read lately have me wondering if Facebook is a viable business in the long-term. I know – it’s huge, it takes in a lot of money, and it seems sort of ubiquitous. At one time, many of those things were said about MySpace or the walled-garden version of AOL, so bear with me. A decent amount (low double digits at one point) of Facebook’s revenue came from Zynga‘s games. Is anyone you know still “Villing”? That goes to the engagement point. More important than that (since revenue sources are fungible), is the fact that younger people don’t seem to be using the service. In fact, the real young crowd – those reaching the age when they would normally join Facebook – seem to be focused on other services. Instagram and Tumblr, by many accounts, are more popular with the young teen set than Facebook is, and that’s been the case for a year. They asked the 61% of Facebook users who have taken a break from using the site why they did so, and they mentioned a variety of reasons. The largest group (21%) said that their “Facebook vacation” was a result of being too busy with other demands or not having time to spend on the site. Others pointed toward a general lack of interest in the site itself (10% mentioned this in one way or another), an absence of compelling content (10%), excessive gossip or “drama” from their friends (9%), or concerns that they were spending too much time on the site and needed to take a break (8%). Many of those reasons are NOT things Facebook can fix since they’re a result of what users are doing and not the platform. That’s troubling. So I’ll put it out there: is Facebook a viable business in the long-term? If it’s just old folks like me catching up with high school pals we haven’t seen in 40 years or our grandkids, is it going to be long before all we see are supplemental Medicaid insurance ads and sponsored posts for hearing aids? What do you think? Have you taken a break from Facebook? Have your kids? Is Facebook viable in the long-term? Is there anyone who hasn’t played solitaire? It seems as if it’s available on every PC and Mac addicts can grab it in Game Center. I have it on my phone as well as on a Nook, and I’ve come to the realization that it’s a pretty good business tool. Let me explain why. There’s the obvious – it gets your brain cranking. I find, however, that there are some other skills that are required to finish many hands. The first is patience. It’s rare that you get through the game the first time you leaf through the deck. In fact, I’ll often use that first pass as a form of research that helps me figure out the strategy for the rest of the game. Doing that research before settling on a strategy is another often overlooked business skill. I’ve found that the key to solving the puzzle (and I’m playing the most common version of the game called “Klondike“) is to get the down (covered) cards turned up as quickly as possible. In business terms this is removing the unknowns so you can get a clear look at the situation. I’ll usually keep attacking the biggest stack of covered cards just as in business we should focus on the areas where we know the least. Since a finished pile – the stacks beginning with the Ace – is an objective, there is a real temptation to add cards from the board to the Ace stack. I only do that when I know I still have a place to put a lower card that still remains. In business we sometimes make that mistake – we try to finish a task without thinking about the rest of the dependencies. Sometimes you hit a wall. All the cards are red and you’re only turning up additional red cards or you get to where you must turn over a specific card to keep going. That’s when the creative thinking kicks in – how can I move something that’s already there to free up a slot? Keeping the same suits (Hearts, Clubs, etc.) in the same lines can be helpful. This often means delaying the play of a card into an obvious opening with an eye on something other than top-line data – the card’s number. Yes, that may be a nuance but using all the information I have – number and suit – helps with the long-term solution, sometimes at short-term expense. Sounds like a smart business practice, doesn’t it? 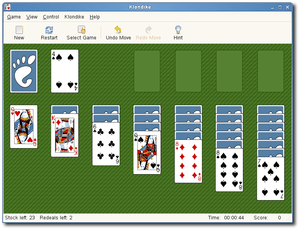 You probably have a solitaire game on whatever device you’re reading this. Spend 5 minutes and try looking at the game in a different way. After all, that’s how we need to approach business too, right?